When it comes to sending IMs instead of working, there is no match for an accountant. Accountants spend most hours in their day in front of laptops staring at excel, outlook, and instant messenger. An amazing thing about how instant messaging works: the more explicitly company-banned instant messaging programs are, the more popular the programs become. 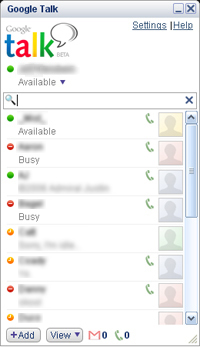 Accountants use MSN/Yahoo, AIM, Gtalk, and company provided programs (like Sametime and Office Communicator). These programs, as you are aware, allow one person to chat in real-time with another person or groups of people. In limited cases, accountants will constantly use e-mail back in forth in place of instant messaging. Note: that e-mail is as good of a timesink as instant messaging. You may think instant messaging is a trivial skill, but accountants always have to take it to the next level. While dealing with others, working on memos, and reviewing workpapers, accountants also have to keep up to date on office gossip and the latest on youtube. Instant messaging allows them to stay current on the latter two. A good accomplice of instant messaging is the privacy screen. Accountants will go to great lengths to sit with their laptop screen facing a certain direction of the room and use a privacy screen. All this careful planning allows them to surf the web and send IMs all day undetected. In situations where such IM programs or websites may be blocked by company policy, it is helpful to know that all blackberries support a google mobile app for Gtalk. This even helps if your firm-owned laptop allows Gtalk, but you fear that IT spies are monitoring your internet activity. Of course, this doesn’t fly if the blackberry itself is firm-owned, but I assume iPhone has a similar capability. The trick is to avoid appearing to be texting all day long. Difficult but possible. How do other accountants handle the incriminating smile or chuckle that occurs when you’re IM’ing with coworkers about something funny? It’s always a dead give away when you’re in an audit room, typing away and someone cracks a smile and or LOLs while staring at their laptop. You may be able to position your laptop in such a manner that it is hidden from your coworkers, but unless you’re wearing a ski mask, there is no concealing the facial expressions resulting from some hilarious instant messaging. Because everyone knows that accountants are way funnier in IM conversation than face to face. So true about strategically placing your monitor in a direction so people coming into your office/cube will not be able to see your screen right away. Too bad my firm bans all instant messaging programs and they have an annoying webpage filter program called Websense which blocks many websites. My typical response to a staff that has that kind of a smirk on their face or is outright laughing is, “Is that spreadsheet funny?” Gets ’em every time. Accountants are way funnier in a) IM and b) drunk than face to face. Accountants are also funnier in masses. They can always be spotted at lunch. operating in Omaha City, which provide various financial accounting services through its 7,909 employees. It is classified as a fiduciary account by the depository bank as a distinction from the regular savings account to ensure proper fund appropriation.